PASADENA – Authorities are looking for a suspect who dropped a large boulder onto a moving car on the 134 Freeway in Pasadena Tuesday night, killing a man who was riding in the vehicle with his wife. CBS Los Angeles reports that at around 8:55 p.m., a 30 to 35 pound boulder — a little larger than a volleyball — was dropped onto the 134 Freeway from the Orange Grove Boulevard overpass, according to California Highway Patrol. The boulder landed on the windshield of a 2017 Toyota Corolla traveling west on the freeway, CHP said. The car was carrying a female driver and her husband, who was in the front passenger seat. The boulder went through the windshield and landed on the man's chest, CHP said. 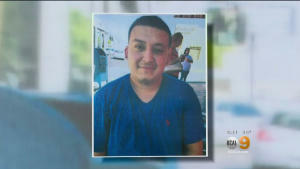 CBS Los Angeles reports the victim has been identified as 23-year-old Christopher Lopez. His wife has been identified as 21-year-old Guadalupe Gutierrez. The car swerved, but Gutierrez was able to maintain control. She then drove her husband to Glendale Adventist Medical Center, where he died from his injuries. Investigators said they are trying to get the killer's DNA off the boulder. Gutierrez, who is pregnant, was also driving the couple's 4-year-old daughter in the car along with her mother. No one else in the vehicle was injured. Today, through tears, she begged the public to help her find her husband's killer. "He's gone," she cried, "But I'm asking for your help. If anyone saw anything, please help us." CHP investigators are looking anyone who may have seen the suspect or suspects who dropped the boulder off the overpass. Anyone with information should call detectives at (626) 296-8100.